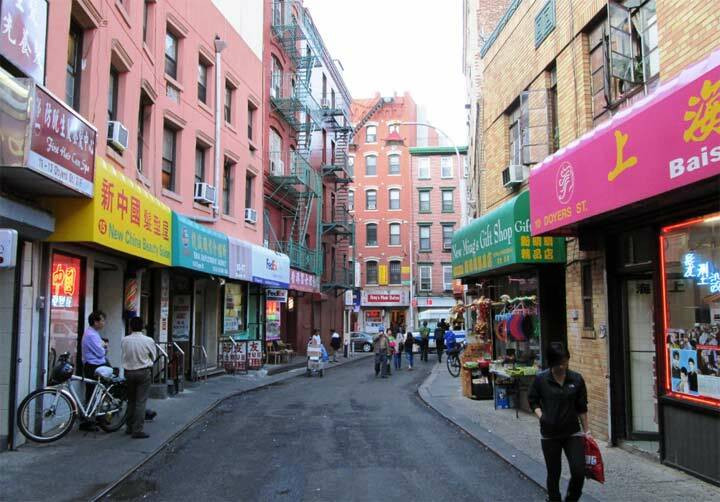 I had just lurched across the Manhattan Bridge after a shift in DUMBO, and was slowly making my way west toward the subway on Varick Street. After a winter of near unprecedented cold and non-melting snow, I was eager for some exercise, so when the temperature nudged above forty Fahrenheit, I ignored my seasonal bouts of pain and fatigue and made it across. My wanderings had some purpose. I wanted to get a few photos of Franklin Place, a one-block alley that runs between Franklin and White Streets just west of Broadway. 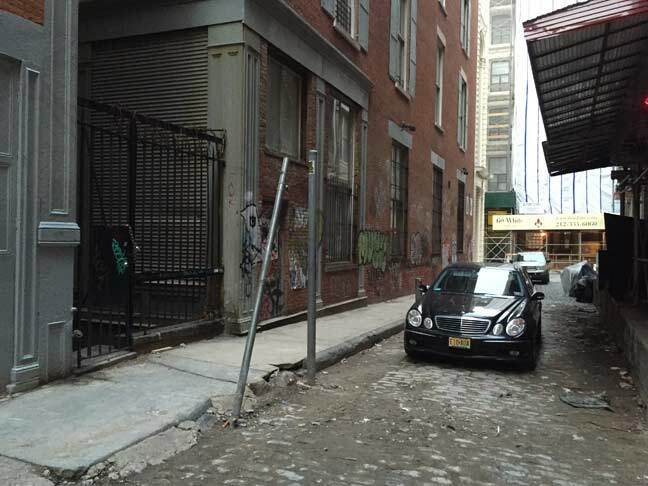 Alleys, as you know, are at a premium on Manhattan island; unlike other northeast metropoli they are few and far between, and over time they have either been eliminated or privatized so they cannot be entered by camera-swinging urban explorers. 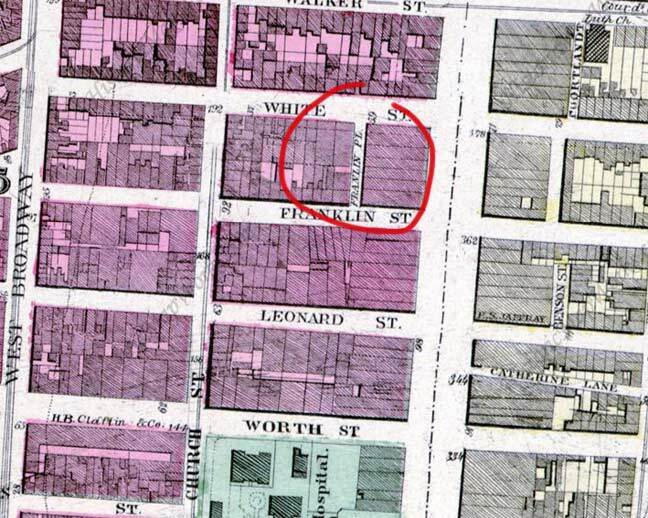 Franklin Street, and the Place named for it, have been there a long time. This Dripps atlas from about 1867 shows it already in place, and every street on this excerpt also remains in place. Before the street was named for the Philadelphia polymath who proved the usability of electricity, stove inventor, editor, political activist and ambassador to France, it was, mystifyingly called Sugarloaf, or Sugar Loaf, Street. The name likely had to do with Sugar Loaf, both a town and a mountain in Orange County, New York. According to legend, in winter the mountain resembled “sugar loaves” sold before cubes or granulated sugar became the norm. (There is also a Sugarloaf Mountain in Colorado; classic rock fans will remember a big hit by the Colorado group of that name in 1970). 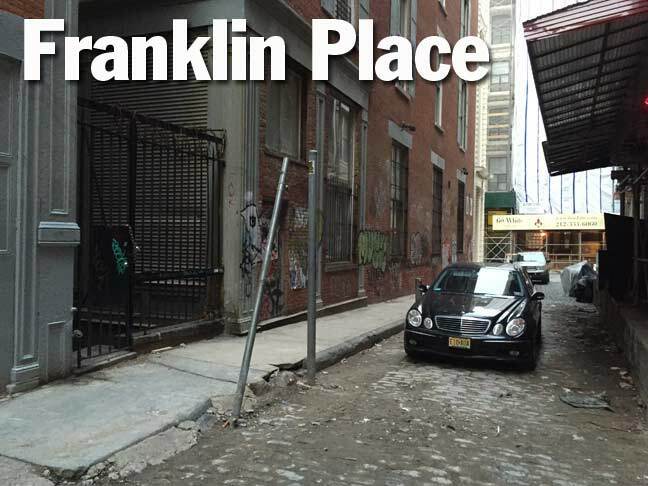 You wonder why Franklin Place, or its brother downtown alleys like Catherine Lane or Benson Place, were built in the first place. 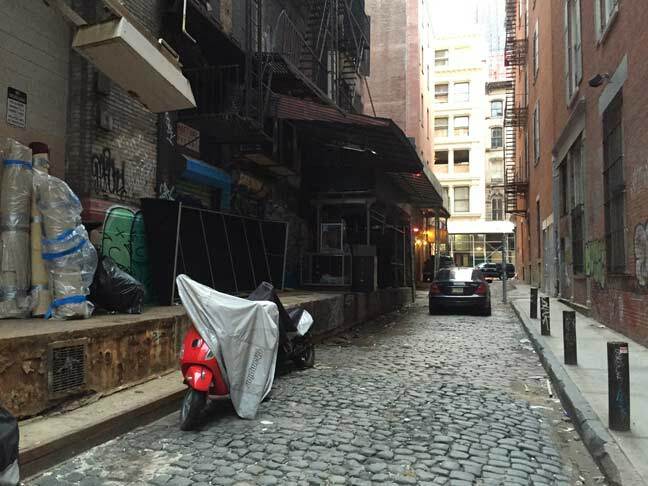 They have likely always served as service alleys, a place to pick up refuse, or a place to keep horses and carriages. The alleys have long outlived such uses. 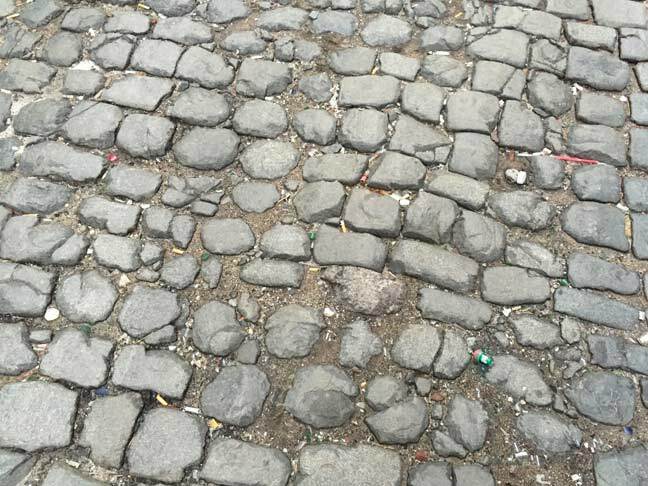 Franklin Place’s Belgian blocks were always cut smaller than on other NYC streets, and have weathered to the point that they have taken on the uneven quality of cobblestones, which are used on no surviving NYC street. No property fronts on Franklin Place. 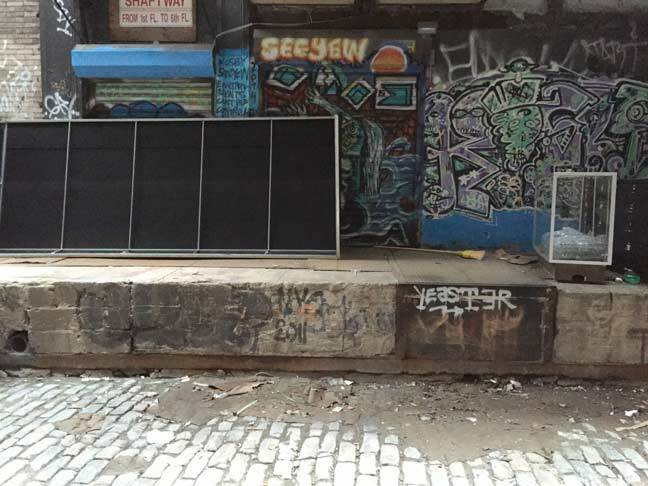 Trucks do use it to make deliveries, and graffitists have found it to be a ready canvas. Franklin Place, as often as not, is jammed with parked cars and trucks, but I caught it on a good day. Franklin Place, as seen looking north from Franklin Street. 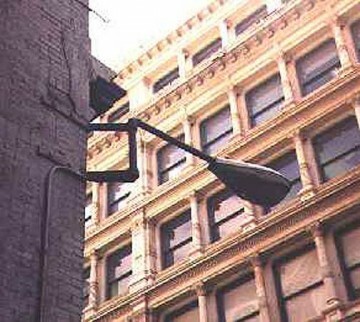 There used to be a lamp attached to the wall seen at right (shown in inset at left) but it has disappeared after renovations were done to that building. The building was constructed in 1861. Note also the Corinthian pilasters on the ground floor and the coral-shaped decorative stonework, known as vermiculation. Great stuff, as always! 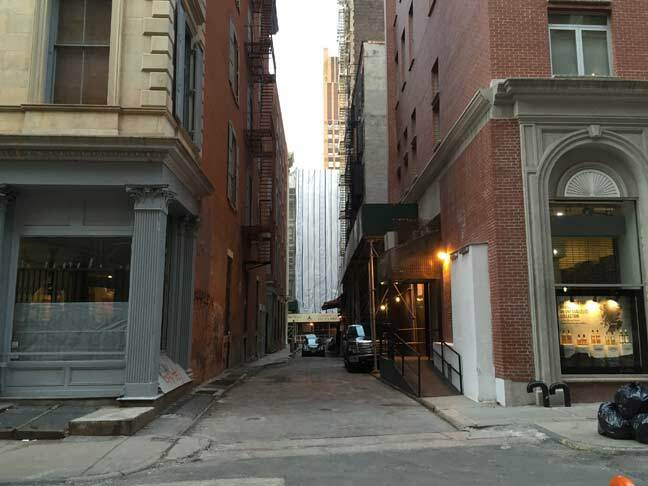 Just FYI, the big condo known as Franklin Place—which goes through to Broadway—will actually have its front entrance on the alley. 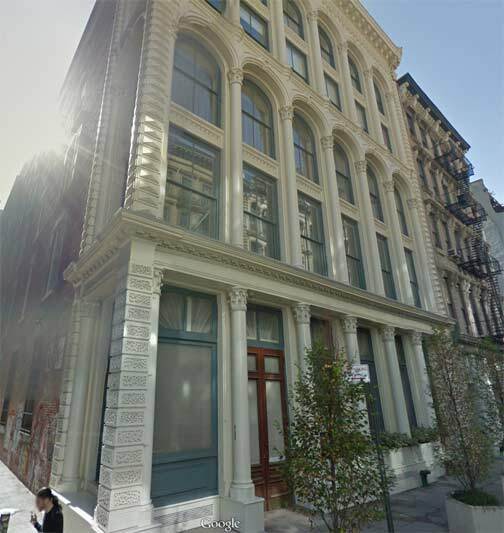 Also, the building at the northwest corner of Franklin and Franklin Place had planned to create an entrance on Franklin Place, but I don’t recall whether it has happened yet or not. There is also a Sugarloaf Mountain here in NC – about mid way between Asheville NC and Columbia SC. Not too far from a town called Bat Cave and fairly close to Lake Lure (where Dirty Dancing was filmed). It rises 3,965 feet and has some great snow skiing – if you are in to that stuff.